Using the amber fluid in cooking, and pairing beer with food. Does anyone have any familiarity with Weber Barbecues? I was looking at getting one in order to smoke meats like chicken, duck or fish, to have with beer of course - just to keep the thread on topic. They are definately great for cooking roast meats. Not sure about smoking, but I reckon it might work, although I am no expert on the matter. Aussie Day Lamb. Lemon, oregano and Rosemary rub. Smoked for 2 hrs on trivet, foiled for 2 hrs, open for 1 hr, all @ 120ish c. Perfect internal temp, moist and melted in the mouth. I've got one I use weekly. Once you get used to them they're hard to stuff up. That lambs making me hungry Rotten. I do similar to Rotten. Lower heat with additions of wet smoking chips about halfway through. Super tasty! If you're not watching BBQ pit boys on YouTube you are missing out. I've never used the Weber for smoking meat, but do use mine for roasting. 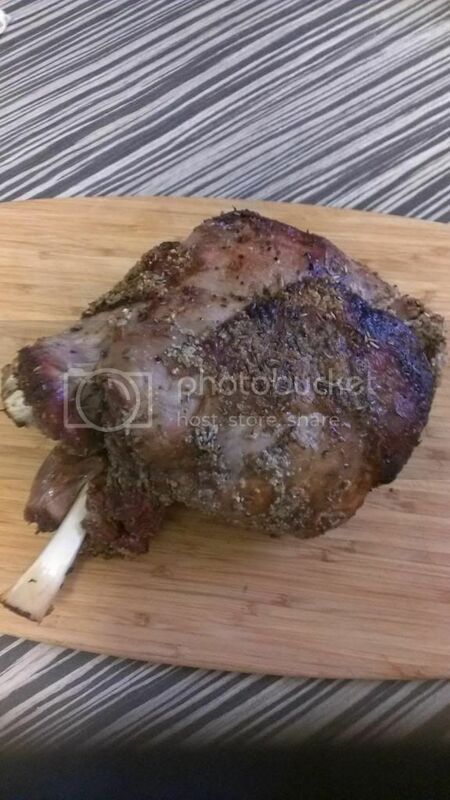 Leg of lamb for 5 to 5Â½ hours at 130ÂºC, and it's so tender I almost can't carve it, it just falls away from the bone. I reckon for slow roasting you can't go past a shoulder of lamb in preference to a leg. We do a 10-hour shoulder at 100C in a covered dish in the oven with just seasoning, a few cloves of garlic stuck here and there, and a little water. When it's done you just pull bits off with tongs. Superb. Bought a smoker box from the big green shed yesterday. Will enable me to use the hooded bbq for smoking/slow cooking chunks of meat. Couldn't resist/wait. 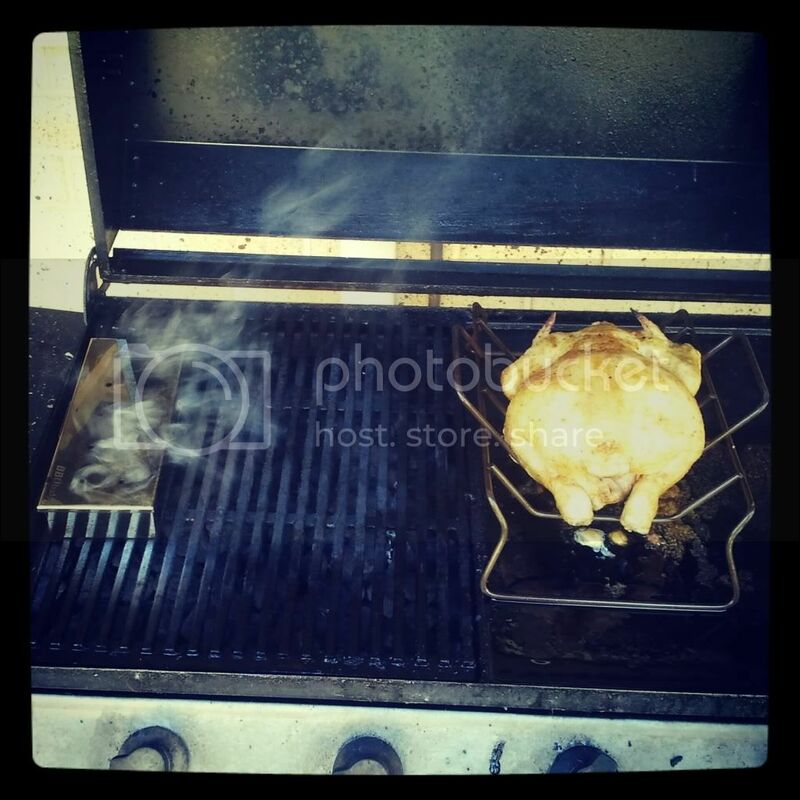 A chook, rubbed with a garlic, paprika and pepper butter. Hickory chips in the smoke box. Smells great. Thanks for the replies, guys. Just what I was looking for. You know, I'd just about decided to bite the bullet and get some Web-ishnous happening, when I go and discover that if I spend a bit more money I can get a Tandoor instead! Talk about making the big decisions! Why not spend a bit more again and go for a wood fired pizza oven? Chook turned out magnificent. 3 hours slow roasting/smoking with honey/lemon baste in the last 20 mins or so. Had enough for dinner Saturday night, lunch on Sunday (homemade sourdough rolls), lunch Monday (homemade ciabatta rolls) and risotto for dinner Monday night. Was a 2 kg chook and there is only a 21 month old plus 2 adults.